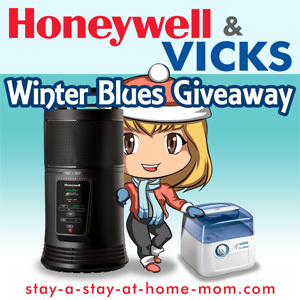 Welcome to the Honeywell & Vicks Winter Blues Giveaway. Hosted by Stay a Stay at Home Mom with co-hosts Mom 2 Bed by 8 and Free Makeup and Beauty Samples. Sponsored by Honeywell & Vicks. One lucky winner will be able to chase away the winter blues this season with a Vicks GermFree Cool Mist Humidifier, Retail Value $69.99, and a Honeywell Energy Smart 360 Surround Heater, Retail Value $64.99, both must-have products for winter. With the weather being so crazy this year, warm one day and ice cold the next, colds and flu are running rampant like rarely have I seen before. Taking preventative measures to avoid being sick just makes good sense. Both of these items give you a running start for beating the season of sick! Enter to win by filling out the Rafflecopter below, and make sure you take the time to visit our wonderful sponsors, hosts, and cohosts! Good luck! Giveaway runs from Feb 19 at 12:01am to Mar 12 at 11:59PM EST. My favorite thing about winter is.... that is when we do most of our traveling south. Thank you Rosey! I have had a great few days celebrating. and let me tell you, I wasn't very healthy in my forties. I had to have my one and only root canal on my 40th birthday, in fact. When I was around 44 I almost died of bronchitis! I changed my diet (mainly cut out dairy) and lost a bunch of weight and haven't looked back. Thank you for being my blog-buddy! (I have dairy occasionally now days but I see a big difference [bad] if I have it ALL the time). I think I need one of these in my house!!! Hmmm, I am not a fan of winter AT ALL, so that's a hard question. I'd have to say I do love the look of untouched snow on the ground. So clean and pure. My favorite thing about winter is staying in the warm house with a good book and having a bowl of homemade chili or vegetable soup. I have always liked winter...I like cold weather. To me it is refreshing. I have an excuse to make chili and cornbread! I'm not a fan of winter, my body doesn't like the cold. But, I love to see the snow, and watch the kids play in it.